Mittens have been on my mind a lot lately. Two little kids plus lots of chilly days equals tons of time squeezing tiny wiggling hands into mittens. And, since I’m always looking for ways to dress up my walls, it dawned on me that mittens would make an adorable addition to my winter home decor. This week, I’m sharing a tutorial on how to make quilling paper mittens. These little darlings are totally customizable. But I’ve done the hard work for you already by designing the basic shape. First, print out this mitten template. Each sheet has two pairs of mittens. You can choose to do a pair or a solo one. As is, the finished size of each mitten is about 3 1/2″ tall by 3″ wide. After printing, place the mitten of your choice on top of your quilling workboard, and cover with a sheet of wax paper. The waxed paper will allow you to easily remove your work when you’re all done. 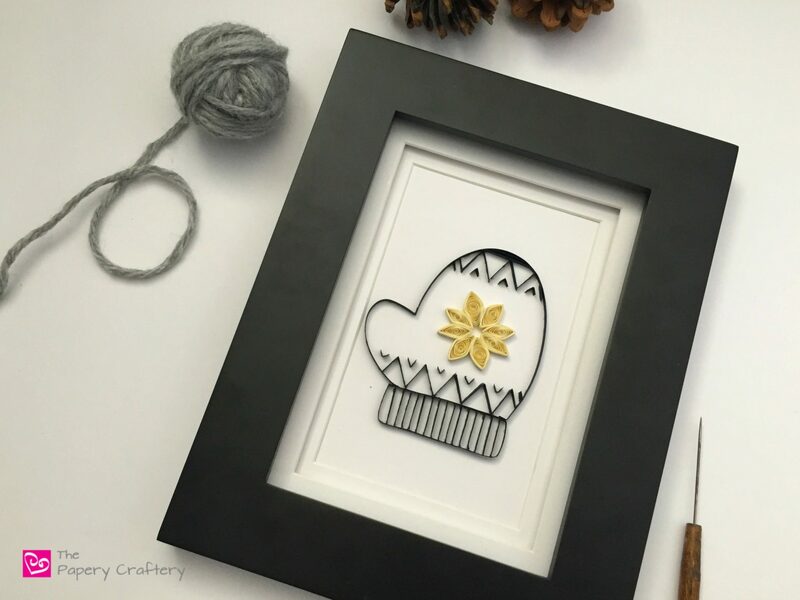 This mitten project is a great practice for on-edge quilling. I know, there are a lot of techniques for on-edge, but I’m going to demo the way I’ve been doing it for years. It’s simple and quick and uses the supplies I already have on hand. To make the outer edge more secure, I make double-thickness quilling strips. I’ve found the simplest way to make these is to fold a long strip of quilling paper in half. Run a thin line of glue down one half and press together. Once dry, the result is a strip that is quite a bit sturdier and holds up nicely to outline work. I like to fold one end of my thick strips slightly and start working on a corner, when possible. Apply a dot of glue right over a corner on the outline of the mitten. Place your bent end on the corner and pin into place. Let that dry for a moment and you’ll have a sturdy anchor to continue on. If you haven’t done it yet, now is the time to invest in a needle-nosed glue bottle. It will make all the difference in the ease of your edge work, as you can just use teeny drops of glue as you go. Add a dot of glue every so often along the rest of the outline, using straight pins to keep the quilling strip in line. TIP: Pins can be useful on corners and straight lines too. Try adding pins to both sides of a strip to keep it in line! As you get to the end of a section, tear the strip and secure it with glue. I started with the base of the design, but the edge of the top section can be done exactly the same way. Once you’re happy with your edge work, it’s time to work on filling in your quilling paper mittens! I went with really classic Norwegian knitting-inspired designs of snowflakes and v-shaped dots. The cuff of the mitten was filled with straight lines to make it look like it is ribbed. TIP: It is really helpful to sketch your design on the template itself. But if you forget until after the edge is done, no worries! You should be able to gently lift the entire waxed paper sheet up, and have the edge of the mitten stay put. Draw what you need, then line your mitten back up and pin the paper in the corners again. Fill in your mitten as you like. Stripes or dots would be fun, too! When all your elements have dried, take out any pins left, and remove your quilling from your workboard. I find it helpful to gently slide my needle tool between the quilling and the waxed paper to loosen any glue that may cause it to stick. Using a small pair of scissors, snip those little glue dots off carefully. Apply an extremely thin line of glue to the bottom of your mitten, and mount for framing. I strongly recommend mounting to a thicker surface, like this mat board. I love the mitten alone or in a pair like these sweet gray and pale green chevron lines. To make it extra special, I also experimented with adding some quick yarn tassels, and a braided string to connect them. These quilling paper mittens were really fun to make. I loved coming up with ways to translate knit designs into paper. I think I’ll make a few more of these to hang in our mudroom for the rest of the winter. How will you design your quilling paper mittens? Tell me your plans in the comments below! I’ve been quilling for years and have avoided doing any edge work. Thanks to you, I now have the knowledge to be able to start some new projects! I really appreciate you taking the time to teach an old dog some new tricks. I do have one question though. What is the best size of paper to edge with? 1/4″, 3/8″, or can you even do this with 1/8″ paper? Great question, Tanya! I think that many quillers would tell you to use wider paper because it’s usually stronger and easier to control. But in an effort to avoid buying new paper just for edge work, I make double thick strips, like I demoed in this post. I also like having my entire piece being the same height, so I use 1/8” for the entire thing. It never hurts to experiment with what is right for you, though!